Kenajid Karamujic was born in 1983 in the municipality of Bratunac, eastern Bosnia. After surviving physical torture during the war, he first fled with his brother to Srebrenica and after that to Tuzla. Kenajid came to Sarajevo in 1999 with the intent to permanently settle there. He attended a secondary school for hearing impaired children where he gained a diploma in auto body mechanic. In 2008, Kenajid married Melisa, who also has a hearing disability, and they had three children. Their two boys, Amir (10) and Almir (9) attend elementary school for children with disabilities in Sarajevo, while the daughter Ajka is 4 years old. The Karamujic family have moved five times from one house to another in Sarajevo. They even lived outdoors for some time “without a roof over their heads”. Before moving into the new flat, the Karamujic family lived in a small inadequate room provided by the municipality as temporary accommodation. Kenajid is registered with the Employment Bureau. Melisa is a housewife without any income. The only source of family income is the child allowance and disability allowance they receive from relevant municipal services. An ORL clinic has confirmed that their eldest son Amir has a hearing disability, whereas there is no diagnosis for their younger son Almir. Although Ajka is believed to not have hearing impairment, she still shows no signs of verbal communication. Kenajid and Melisa take good care of their children despite all the difficulties and the minimal income they receive through social assistance. Their relationship is positive, harmonious and they communicate constantly. Kenajid learned about the Regional Housing Programme from officials in the municipality of Ilidza. After he found out that his family has been given a new apartment, he said in sign language: “All this time I have imagined the new apartment and how to furnish the rooms”. 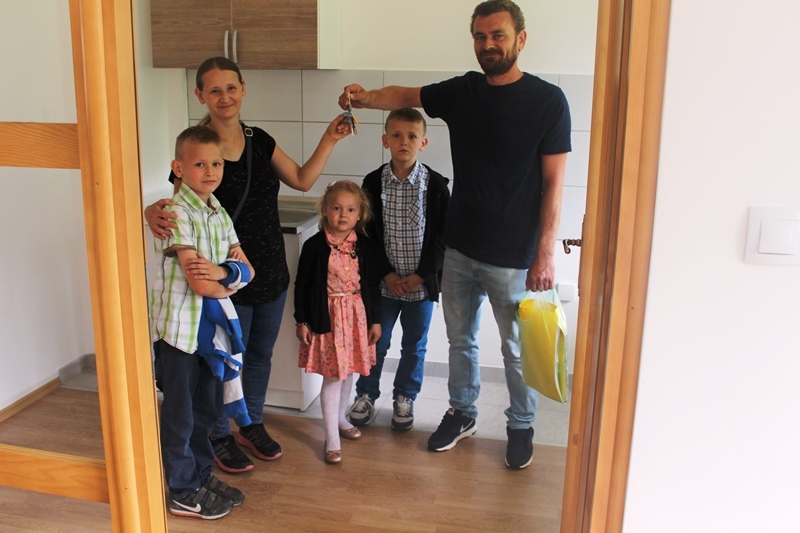 In June 2018, the Karamujić family moved into the new multi-apartment building constructed within the Regional Housing Programme under the BiH3 sub-project in the municipality of Ilidza. All family members are very happy that they have finally resolved their housing issue and started a new life in the brand new apartment.